Anyone else out there a magazine freak? I totally am. Ever since high school (aka when I had no bills to pay and therefore had an abundance of cash) I have been hooked on the newsstand… newsstand may not be the right word, gossip rack is probably more accurate. Anyways, since then, and since my bills have grown ten fold (is that a lot? I’m trying to say a lot, a lot) I’ve managed to stay away from the gossip and fashion mags. That is not to say I have stayed away from magazines. I LOVE FOOD MAGAZINES. I live for the day Bon Appetit shows up in the mail, I impatiently await the arrival of Cooking Light, and I get giddy when my momma brings down her old copies of Food & Wine for me to have. Reading about different food topics is nice, and the endless amount of recipe inspiration is wonderful, but really what I love and anticipate more than anything is looking at all the food pictures. Weird? Maybe, but I just can’t help appreciating a gorgeous photo of some tasty food. 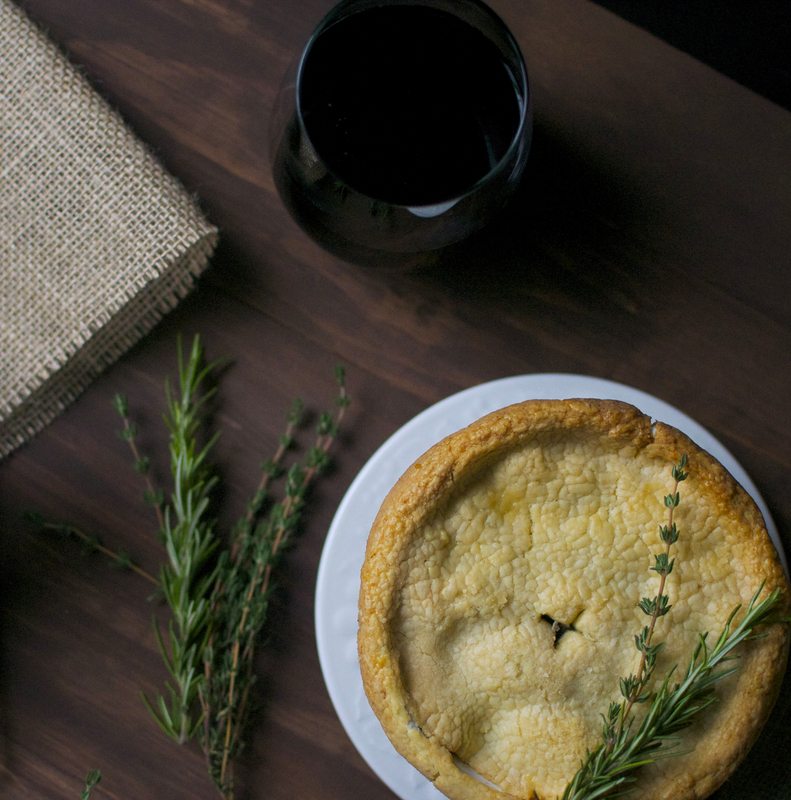 I find myself more and more interested in food photography and food styling. It can truly be so beautiful. Also, drool inducing. 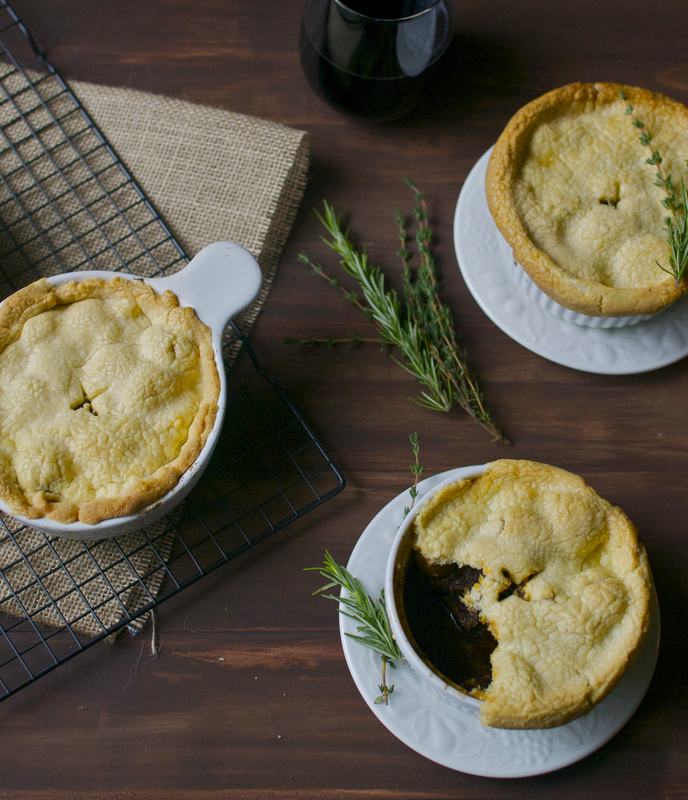 Last month’s issue of Bon Appetit featured a delicious looking short rib pot pie. 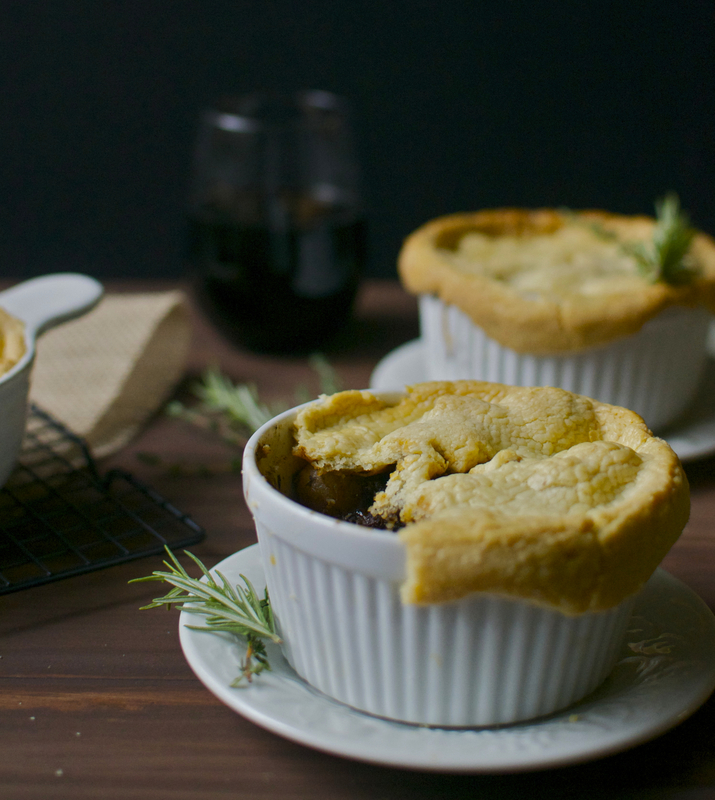 While the title sounds good, the photos threw it over the edge and suddenly, right there and then (10am at my work desk) I HAD to have short rib pot pie. Obviously, that didn’t happen, but it did happen today. And thank the heavens it did. 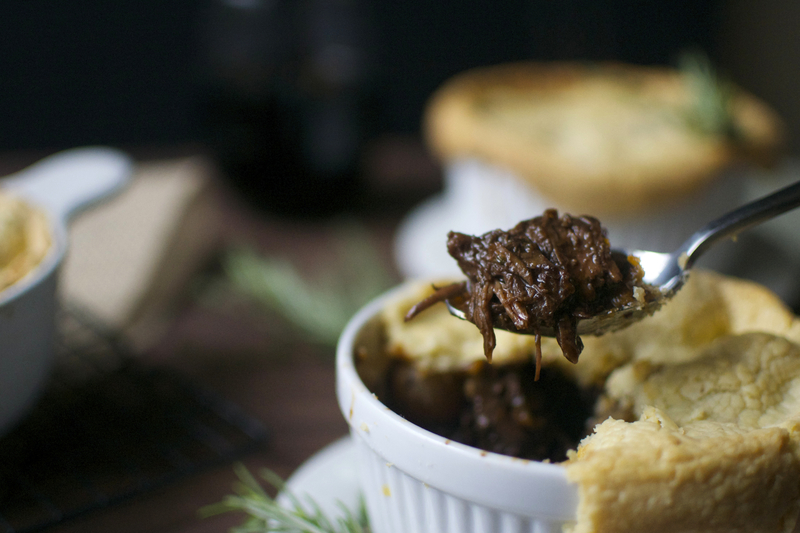 This was incredibly rich and comforting and tasty and perfect and… I just love it. I made some modifications to make it grain free (and because I can’t seem to make a recipe exactly as is). This is tasty and warm and I really think you should make it. Add all the ingredients, except the water, to a food processor and pulse until the butter resembles pebbles. One tbsp at a time, add the water and pulse to combine. This dough won’t be like a traditional dough. It will be sticky and not necessarily clump into a ball. Scrape the dough into a pile on some plastic wrap. Form into a disc and wrap securely in the plastic wrap. Chill in the refrigerator for at least an hour. Heat the ghee in a large dutch oven over medium high heat. Season the meat with salt and pepper. Working in batches, cook the meat about 2 minutes on each side until evenly browned. Using a slotted spoon, scoop the browned meat and set aside, and repeat until all the meat is browned. In the same pot, add the pearl onions and carrots and season with a pinch of salt and pepper. Cook about 8 minutes, until the vegetables are nicely browned and slightly softened. Set aside. Reduce heat to medium, and the garlic to the pot, and cook about two minutes. Stir to prevent the garlic form burning. Add the tomato paste, stir, and cook an additional 5 minutes. If you feel the pot is too dry, add another tbsp or so of ghee. Add the red wine, rosemary, and thyme (I like to tie the sprigs together with kitchen twine, but this is optional), making sure to scrape up the brown bits. Bring to a boil and cook about 8 minutes, or until the mixture is reduced by half. Add the beef stock and 4 cups of water, and bring the whole thing to a boil. Add the meat back into the pan, reduce heat to a simmer, and cook, uncovered, about 2 ½- 3 hours, until the meat is fall apart tender. 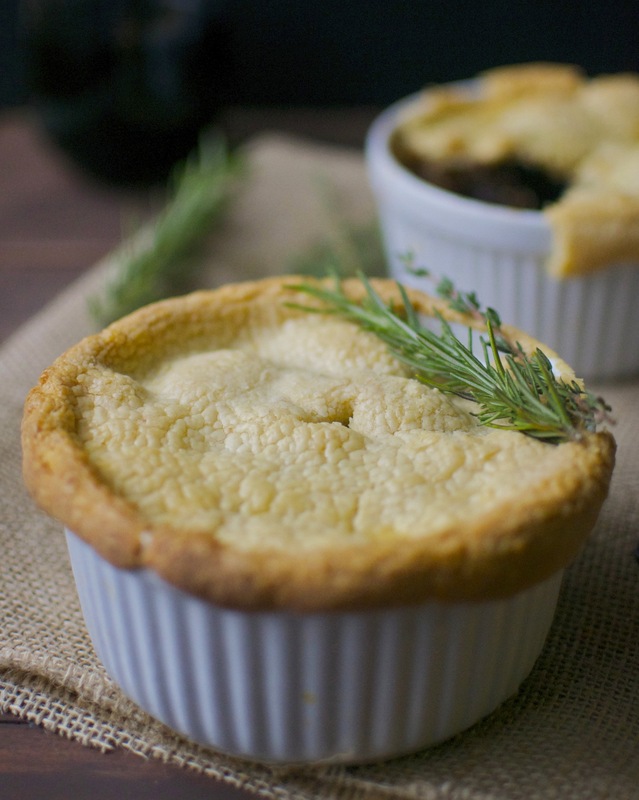 Using a slotted spoon, remove the meat and herb sprigs from the reduced liquid and set aside. Whisk in the arrowroot powder and continue simmering for about 5 minutes. Add the meat, onions, and carrots back into the pan, stirring to combine. Season mixture with salt and pepper. Preheat oven to 375. Transfer filling to four individual baking dishes. Divide dough into four pieces. One at a time, roll out each piece between two pieces of parchment paper, using extra arrowroot powder for dusting. Each piece should be about ⅛ inch thick, or enough to cover the small baking dishes. Carefully, transfer dough to cover each dish, tucking under the overhanging dough. 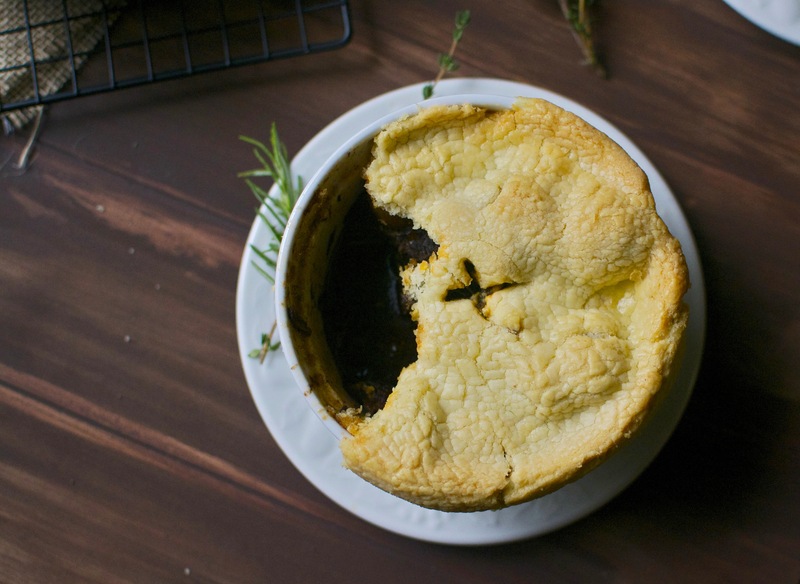 Cut a small “X” into the top of each pot pie. In a small bowl, whisk the egg with a splash of water. 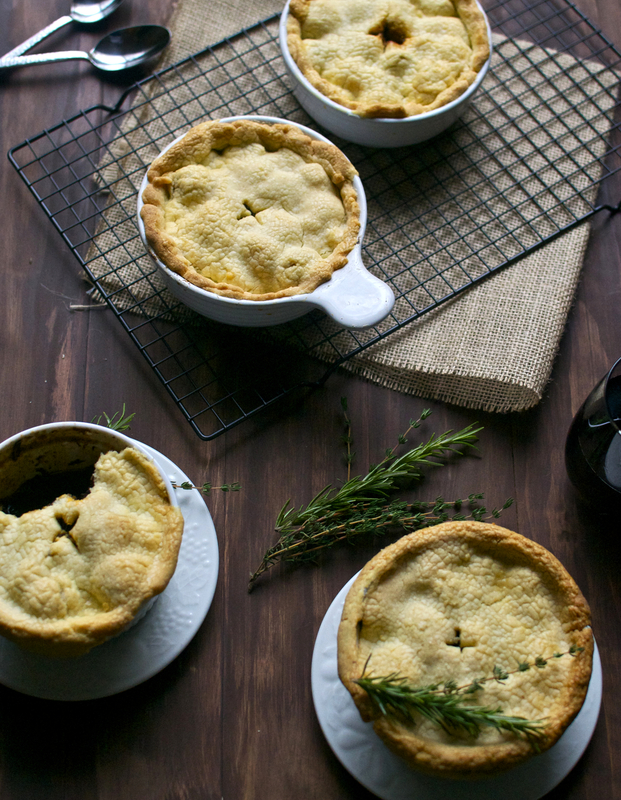 Brush the egg wash onto each pot pie. Place the pies on a sheet tray and bake 45 minutes, or until golden brown. Remove from oven, let cool a bit, and enjoy!! J’ai été recommandé suggéré ce blogue site web par mon cousin.